New Aural Discourse holds four fresh, futuristic and far-sighted British takes on Detroit techno by arguably one of electronic music's best-kept secrets. This is N.A.D. 's comeback release after over 25 years and it's a proud salute to the classic sounds of the Motor City. 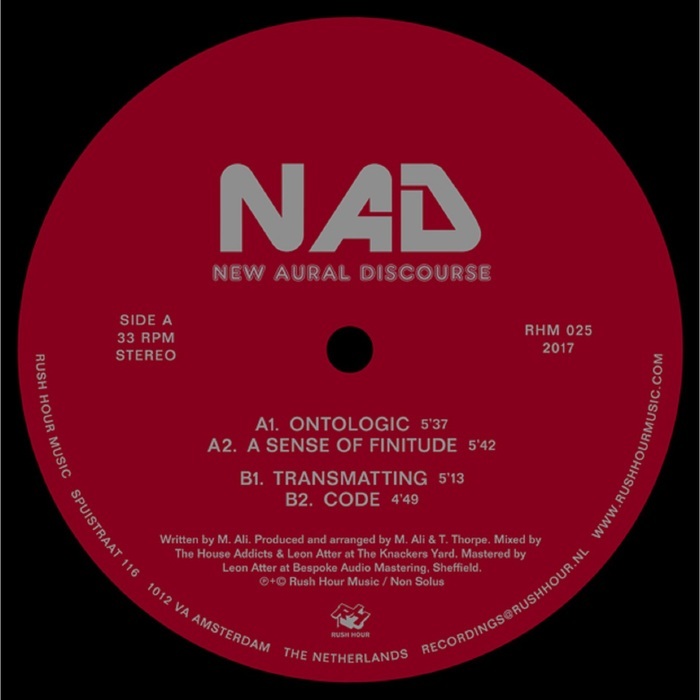 Starting off with the hi-tech soul of "Ontologic", they're then into some UR style intergalactic transmissions on "A Sense Of Finitude". The flip features what we thought was a highlight in the form of "Transmatting" with its complex drum programming, funky bassline and evocative strings: it sounds like an old Transmat (hey, hang on!) style jam. Initially, the duo of Tony Thorpe and Mustafa Ali released one album entitled The Dawn Of A New Age, which was on sale for little more than a week before it vanished from record store shelves. Decades after it was created, their forgotten debut album became something of a 'must-have' for electronic music collectors.